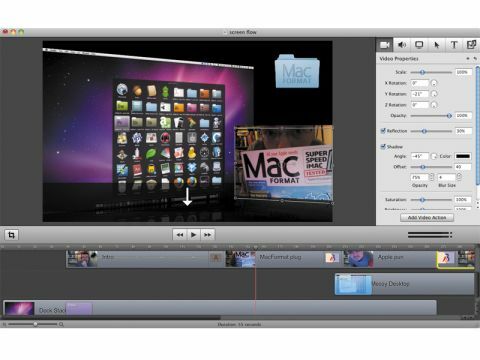 While QuickTime X offers basic screen recording in Snow Leopard, ScreenFlow is an all-in-one solution, enabling you to record several sources at once – screen, camera, audio – and edit and export the results. A year back, we liked ScreenFlow 1.2, and this is a strong upgrade, still offering excellent performance and a userfriendly editor. Control over video is improved via several new settings and features. There's basic colour correction and effects, such as rotation – previously a little abrupt – which can be softened via the Curve feature's 'ease' settings. A selection of 2D and 3D transitions is available to apply to overlaps, and the most baffling ScreenFlow limitation, the inability to move content between projects, is gone. You can now copy and paste between timelines or drag items between Media tabs. Some niggles remain, however. Clips in the timeline can be split but not merged, and Option-dragging won't copy them. Effects can't be cloned but must be applied to each clip, and stage items must be dragged to move them. The persistent lack of titles is a surprise too, although text boxes provide a basic alternative. Audio effects and ducking mean you needn't process voiceovers in another app, and YouTube publishing has been added to export options. So for ScreenFlow fans, this is a no-brainer upgrade, and for newcomers it remains the best tool of its type. But it's still too pricey for dabblers.